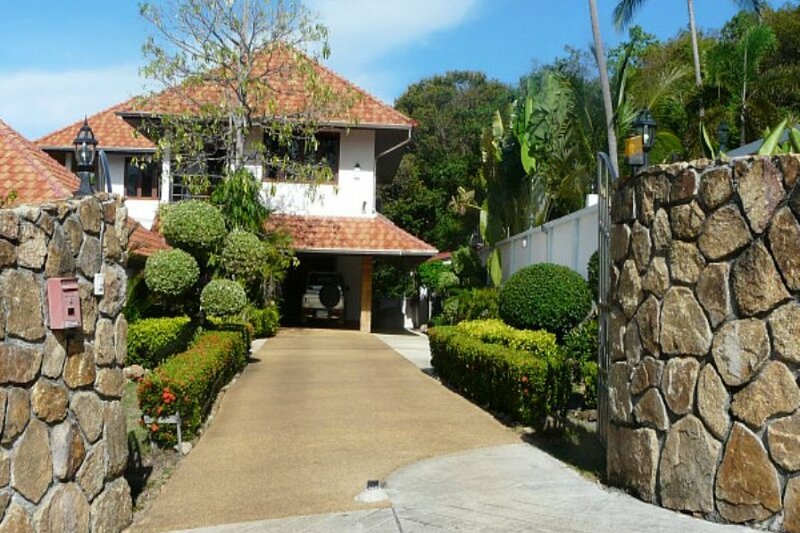 This beautiful villa is situated on a hillside in the Bophut area of Koh Samui. Boasting spectacular views the property is situated in landscaped gardens with a sandwashed driveway leading to covered parking. Secluded sizeable figure eight swimming pool with built in Jacuzzi. Large six meter by eight meter luxury outdoor lounge with pool table, drinks refrigerator and 3 piece suite. Adjoined to the house next to the pool is a natural stone waterfall. The house consists on Ground level ; open plan Lounge, Kitchen, Dining Room and toilet. There are three ceiling fans and one air conditioned unit. Satellite TV is installed as is internet access. Decking leading directly to pool. Upstairs ; wooden staircase leading up to a substantial hallway opening onto 3 large double bedrooms. The very large master bedroom has en-suite bathroom, dressing area and large balcony with uninterrupted views. Bedroom two is also en-suite with balcony and has sea views and views of neighboring island Koh Phangan. Bedroom 3 is a good size double. There is a fourth self contained double bedroom on the lower ground level with very large en-suite bathroom. All bedrooms are furnished with King size beds with matching wardrobes and dressing tables and are equipped with air condition units and ceiling fans. The property also boasts an eight meter by six meter fully equipped gymnasium. Outside there is a dedicated patio area with washing machine and drying area. The villa has electronic gates, alarm system and fully lockable shutters for added security. Ideally suited to accommodate a family or groups of up to 8 persons.